RTL Blog: How is a security expert like a QA tester? "Very few security problems in the wild are the result of bugs which are tripped over all the time -- such bugs don't survive long enough to cause problems for security. Rather, security issues arise when an unanticipated rare occurrence -- say, an exceptionally large input, a file which is corrupted, or a network connection which is closed at exactly the wrong time -- takes place," adds Percival. 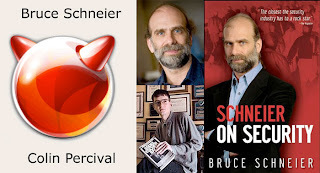 But those thoughts that Schneier describes are a tester's thoughts, those occurrences that Percival describes are the ones that a tester should bring about. Testing is not just about making sure that software operates correctly in response to everyday occurrences, it's about making sure that software operates as close to correctly as possible in response to rare, perverse, and malicious occurrences. Testers explore the universe of possible situations that software can be subjected to. Security concerns are part of that universe. Although QA testers aren't and shouldn't be security experts, they need to have a grasp of it. QA testers need to be very broad generalists to test well because, like security experts, they need to have an eye on the big picture, and they need to be, as Percival suggests, rigorous. This is part of why good testers don't need to come from a computer science background: any background that teaches lateral thinking, rigorous analysis, and thoroughness can produce a good tester. Those skills are what we in the QA industry should demand from ourselves.